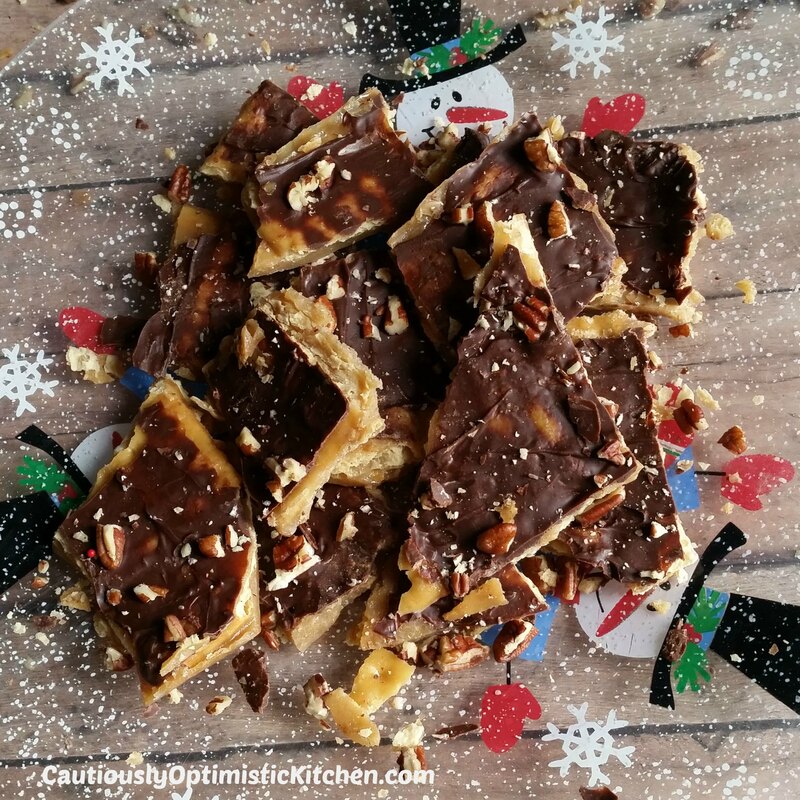 If you are a fan of crunchy sweet caramely goodness, then you will love this recipe for Christmas Cracker Toffee. This isn’t ordinary toffee, as the name implies. This is a recipe you’ve probably seen before actually. It’s all over Pinterest and Facebook. But there’s just one thing that really gets me about all those recipes…. I’m going to get all serious for just a moment, and let you know how much this term bothers me. I will not click on any Pin or post that refers to a recipe as “crack.” I don’t care how good it looks. I just find it really…. I don’t know…. inappropriate? There are so many other terms out there to describe the addicting nature of an item, that I just really try to stay away from this one. We all know what crack is and it’s true nature and very real effects. I just don’t think it’s the correct word to describe candy or any food, ya know? Bloggers, Pinners, Facebookers can we PLEASE stop using this term already??? Use that brilliant mind of yours and find something a little more creative! Ok, now that’s out of my system, on to the recipe! 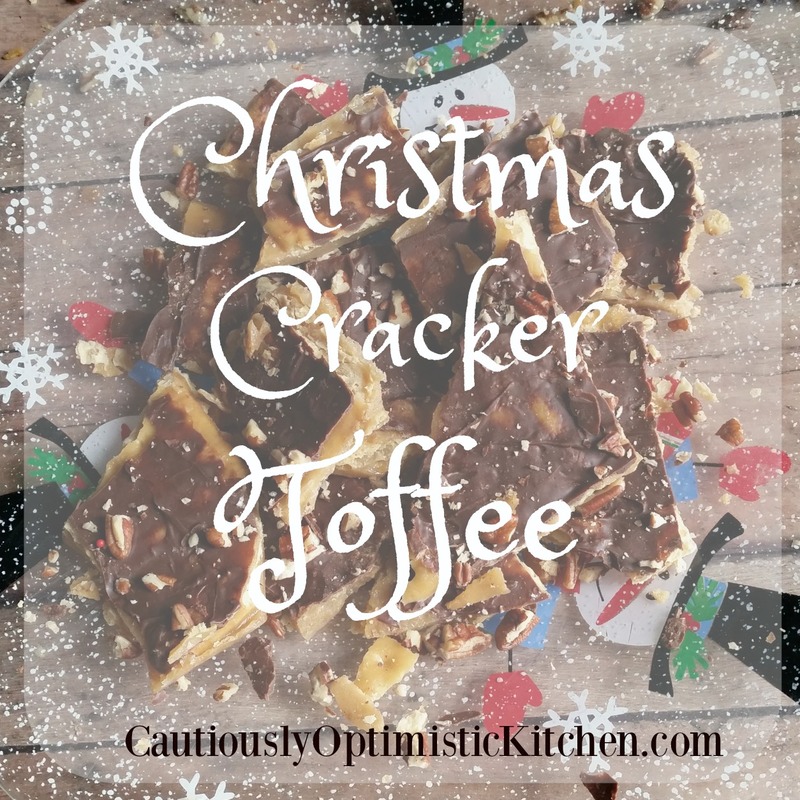 So, this Christmas Cracker Toffee is absolutely yummy! It is made with just a few ingredients and goes together very quickly. 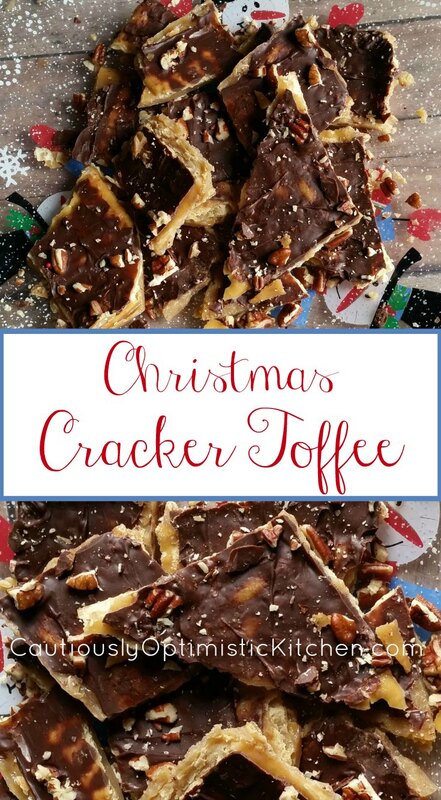 It’s even easier than traditional toffee! Just be warned, it is truly addicting! Place saltines in a single layer on foil lined 9"x13" jelly roll pan or cookie sheet. Combine butter and sugar in a heavy bottom saucepan. Bring to a boil and boil for 3 minutes. Pour toffee over saltines and spread evenly. Bake in preheated 400 oven for 5-6 minutes or until bubbly. Once chocolate is melted use an off set spatula to spread over the toffee. Sprinkle with pecans if desired. Place into refrigerator to finish setting. Once cooled remove from refrigerator and break into small pieces. Store in a tightly sealed container at room temperature or in the refrigerator. There you have it! A quick and yummy recipe for your Christmas candy tins! What’s your favorite Christmas candy? Let me know in the comments below!